Bechtle, Mike. 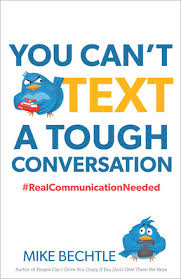 You Can’t Text A Tough Conversation: #RealCommunicationNeeded. Grand Rapids, MI: Revell Publishing. 2015. This entry was posted in Christian Books and tagged Christian, Christian Author, Christian Book Review, Christian Contemporary, Communication, Inspirational, Mike Bechtle, Texting by Savurbks. Bookmark the permalink.